A sstunning Van Cleef & Arpels diamond necklace featuring 14.56 of finest quality diamonds. The round brilliant cut diamonds have a total weight of 11.82cts followed by 2.74cts of baguettes. 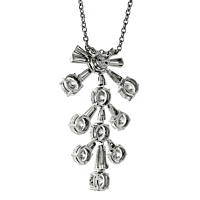 This fantastic platinum necklace and pendant will stand the test of time, and will be enjoyed for generations.